It was the Autumn of 2001 and the baroness & I were living in Boston, Massachusetts. I was a bitter drinker when we left the UK in the Spring that year, naively drinking smoothflow bitters or Tetley cask (there wasn't much else available in Ormskirk back then to be fair). There was a liqour store (Harvard Wine Company) at the end of our road which had a good selection of bottled ales with a large dominance of Sam Adams beers. I knew they were brewed in Boston and so I thought "why not!" and bought a case of the now ubiquitous Boston Lager. I fell in love with it, I loved the fact that it had that familar bitter taste but also like the 'bite' that it had at the end (otherwise know as a hoppy finish but I knew nothing about hops then). Sam Adams were the masters of churning out 'seasonal' brews, it seemed that nearly every time I went in a liquor store there was a new Sam Adams ale to try. I was fond of picking up a mixed 12-pack, three bottles of each type, two which were 'dark beers' (which I now know to be porter and stout) and a couple of lighter ones (which I preferred). Friends and family liked to visit us out there (who wouldn't want to stay five minutes walk from Harvard Square?) and I'd always make sure I'd get some Sam Adams in for their visit. This brings me to the particular seasonal that has inspired me to write this blog post. My parents chose to come out 'in the fall' knowing that it was a beautiful time of year to visit New England, still warm enough for shorts and tshirts but cool enough for the trees to start turning every shade of colour from green to brown. 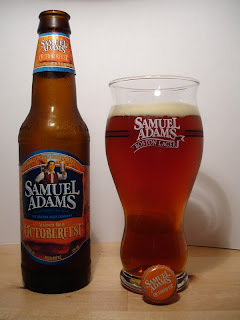 I picked up the regular Sam Adams mixed case and also a 12-pack of their seasonal 'Octoberfest'. My dad and I promptly started with the regular Boston Lager working our way through the standard pack and then moved onto the Octoberfest. Oh boy! It was just so drinkable! You know that knowing nod that drinkers give each other when they try the same beer for the first time? We were nodding like Churchill dogs! Bottle after bottle was drunk, the slightly spicy aroma was perfect for Autumn, the balanced malt-led ground spice bitter taste slipped down easily and the hoppy finish cleaned up the palette perfectly ready for the next mouthful. We ploughed through that pack that night and for the rest of the week of their stay that was all we drank when home in our apartment! I have no idea how many 12-packs we got through but it's about the only beer that has very vivid fond memories for me, and knowing that I shared it with my father made it even more special. We moved back to the UK in the Autumn 2002 narrowly missing it's release so I only got to drink it that one 'season' and it was sorely missed once I was home. I found out I could by Sam Adams Boston Lager in Ormskirk's Safeway (now Morrisons) but never any of the seasonals. Now back then I wasn't 'into craft ale', didn't know what an IPA was or any other beer style, I was just drinking with my taste buds. Once I became the baron in 2009 I was a lot more aware of the great ales available in this country and found out that ales were commonly imported from the states but I'd never seen this beer available in any online beer store. My wife surprised me last Christmas, a hand picked selection of beers from Beer of Europe including Sam Adams Octoberfest! She placed the order with them because they had that beer, she knew as well as me that this was a beer of memories - I was so pleased that she got me a bottle! This then brings the story back to the present when John Humphreys of Shepherd Neame tweeted last week that he was supping Octoberfest, I mentioned that it was a memorable beer for me and he very kindly sent through one of his bottles which arrived yesterday. I'm drinking it now as I type this post, thank you so much John for allowing me a little trip down memory lane!